There are also meta pages covering references, intro, conclusion, index and so on. A light bulb went off and I wanted to delve deeper into the biggest mistakes I (and maybe you) make when handling preparation for games. This article, then, covers the three insightful GM prep pain points Phil identifies, plus a couple of personal ones from my own book of mistakes! But before diving into today’s dish of prep faux pas, I wanted to call out a couple of quotes from Never Unprepared. I agree very much with this, that good prep gives you a feeling of confidence. A sign you are preparing for game sessions well is you feel confident going into the game session. You feel like you can handle whatever the players throw at you. You feel you’ll weave great tales of adventure with your players based on your ideas and designs. And you feel great about the materials you’ll need to play the game well. Herein lies a gem from Phil’s advice. If your goal of prep is confidence, then you just need to figure out what makes you confident going into each session. Once you know that, you know exactly what to prep! For example, maybe you run a game with a good amount of crunch in it, like Pathfinder or D&D. Confidence for you might mean rules mastery and a pool of pre-designed game elements, such as NPC stat blocks. Or perhaps confidence for you means having a published adventure primed to run – studied, tweaked and ready to serve up like a hot dish of roasted PCs (with a touch of pepper). Alternatively, confidence might mean having a bullet list of ideas and a map in your back pocket. The lesson here is to figure out what makes you confident, for once we delve into our own recipes of confidence I bet we’re each different. So no one can tell you exactly what you need to prepare for you to feel confident. If you are unsure, you can check out books like Never Unprepared or the Adventure Creation Handbook to give you ideas. When running games, be sure to note the parts where you stumbled and a bit more prep could’ve helped. Track these moments and make a pre-session prep checklist for yourself. Improve your checklist over time until it becomes the perfect prep recipe for you. I thought this was great advice from the book. Great job, Phil. When I read this I put my iPad down and thought about it. Is silence really a bad thing? My conclusion: if not used for dramatic effect or as a short bit of player recovery after something intense, then yes, silence is death. If you get stuck and can’t think of what happens next, the ensuing awkward silence is hard to bear. If you get stumped on a rule, the silence caused from all the research deflates the game. If you can’t find what you’re looking for in your notes or book or adventure, the pause diffuses attention and excitement. The first bullet is perhaps your worst GMing nightmare. Mental writer’s block. A creative stumper. One solution to all those potential silent killers is good game prep. And that falls back to who you are as a game master and what you need to feel confident, because confidence puts you in a frame of mind where you never get stumped. You are in the zone and have super recall. You handle tricky situations like rules issues with ease. Finally, I want to pull a model out of the book for you, as I think it’s a great way to think about the carrier waves of game prep. I was going to call these four things goals. But we already have a goal for prep: confidence. Therefore, these four things are the paths to confidence, sort of like carrier waves. Do these, and you’ll feel confident. Accessible – What you’ve prepared must be available during games when needed. Organized – Find stuff fast. Effective – What you’ve prepared must actually be useful to you during games. Nail these, and you will be a confident GM. Now, onto the big mistakes of game prep. Have you ever written a huge background for an NPC, place or item, then realized how little time is left before game day, so you start scrambling? I recall writing session logs that took a whole week, which left me no time to get ready for next session. I also remember writing vast histories for a homebrew game world called Seven Cities. All that writing left me exhausted and not interested in doing anything else to prep for a while. The irony? I wrote about the creation of the universe and the formation of the gods. That’s it. I was exhausted and I had not even started writing about the lands of the Seven Cities and the kind of games and adventures that might take place there. I got stalled in meta land. So, if you feel pressure to write a lot to be prepared, and this makes you procrastinate, then stop writing. It’s not necessary. However, if you love creative writing like I do, then writing a lot about your campaign is great as long as you manage your time and energy well. I find writing helps me explore the setting and its peoples better than any other activity. It’s better than just reading a whole bunch and trying to absorb all the details. When I write and create my own stuff, I have better, longer recall of it. It becomes part of me – I just “know it” when the time comes to use it for prep or during games. Find your sweet spot between creating enough details to feel confident and not writing so many details that you run out of time or energy to be fully ready for next session. If you like to write, create a To Do list of what you need to do to be ready for next session. Then put time limits on your creative writing sessions so you leave enough time for the other stuff. Try to do a lot of creative writing before you start campaigns. Use this activity to set a strong foundation of knowledge and readiness, so prep you need to do during the campaign is diminished and easier. Through experimentation, learn what notes style helps you GM best. For example, I’ve found bullets work better for read aloud text than full paragraphs. Consider using stat blocks more often for various game elements. I’ve published a few stat blocks for different types of game elements in past emails. Stat blocks create consistent information entries, such as for NPCs and items, and can forestall the need to do a lot of writing because of the efficient format. Try sawing a board with a hammer. You need the right tool for the job. The wrong tool will leave you frustrated, ineffective as GM and stressed out when you prep. You should not only consider the physical properties of a tool, but choose a tool and preparation system you enjoy using. A tool you hate lies unused. For example, you might use your computer for preparation, but not have it available at the game table, so you need to print everything out, which is always a last-minute mess. Or, you might have five different pieces of software for notes and idea capture, making consolidation a nightmare. I use MyInfo software for prep (plus some helper software and websites). But I’m always tempted to use a GM binder. And I also love the idea of going back to index cards. Reverting to a binder or card boxes would be a mistake though, because then I’d have information sprawl – some information on a computer and some on paper or cards. Plus, I love the search, tag and customization features of MyInfo, so it’s a tool I’m always excited about. Experiment with different methods of preparation and organization for a while. Then pick what you like best. Stick with your decision! No system is perfect. Do not think the grass is greener on the other side. That will always be true. Stick with your chosen system and make it work for you, or risk getting bit by Mistake #2. Then pick your tool(s) of choice. Avoid flip-flopping between tools (see bullet #2 above). For example, quit downloading notes apps and just pick one and stick with it. The more you use a tool, the more you will master it and learn how to make it work best for you. Prepping while tired makes you dislike prep and it generates poorer results. Some people are better in the morning, some in the evening. You might work better on weekends, or perhaps a half hour a day right after work or school helps you unwind *and* get prep done. Never Unprepared goes into detail about your creative cycles and taking best advantage of them, which is great. The book also guides you through schedule creation. Author Phil has a project management background, and he brings that to bear in his top-down approach to figuring out a schedule that helps you take best advantage of your peak creativity times. I think just calling out that you have periods of higher creativity is brilliant. Once you realize, “Yeah, I am more creative when hooked up to my coffee intravenous each morning” you gain a key personal insight you can take advantage of for better game prep. For me, I’ve tried the top-down approach of figuring out a weekly schedule and I have a slightly different angle. Instead of making a calendar and filling in all the time boxes, I decide when I’ll do game prep each week and book an appointment with myself. I carve out this time and have everything else work around it, letting it all sort itself out. I used to spend time each morning before work doing prep. But recently I’ve switched to after work. I get home from work, do a half hour of prep, then a half hour of exercise, and then I’m ready for whatever the evening has in store for me. The end result is the same. Whether you fill in a whole calendar or just carve out protected time, you set yourself up for success. Determine when you are most creative, inspired and interested in doing game prep. If unknown, experiment. Know thyself! You might have different strengths and preferences at different times. For example, mornings are my idea times, and afternoon breaks are great for organizing and research. Evenings are good for crunch. That’s me. How about you? Make a schedule or book an appointment with yourself. Either way, protect your prep time and keep appointments with yourself – don’t be a no-show. Always be thinking. I do a lot of prep just by thinking and imagining when my hands are busy but my brain is idle, such as while mowing the lawn. When it comes time to put fingers to keyboard, I already have a lot figured out. 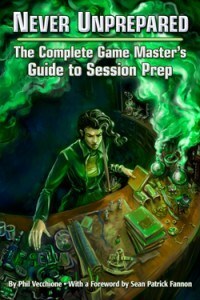 Game Master’s Guide to Session Prep. The book is available now for preorder. I promised you five GM prep mistakes. I’ve covered the three mentioned in Never Unprepared today. In another post, I’m going to talk about two others I’ve learned the hard way over the years. The first is called Not Rewarding Yourself. Many GMs don’t like preparation. I was not a fan of it myself for awhile. And my games suffered because of it. You might be great at ad libbing and running from just a few ideas written on a napkin. But I feel a little preparation helps even those GMs who can wing everything. Adding a bit of polish to your ideas will make them gleam even brighter. Connecting more dots between sessions will turn you into a storytelling genius. And showing up to a session organized, prepared and confident will help you have even more fun every game. Once I clued into the proper mindset for preparation, my whole game changed. Yours will too.